The IPC Gansow 510M push sweeper is the ideal sweeper for all outside areas. Used for cleaning pathways, car parks, warehousing etc. The cylindrical brush will collect leaves, litter, stones and will clean right to he edge with the side brush. Heavy duty construction with a painted steel frame and strong blow moulded waste tank. 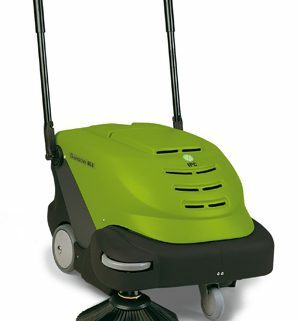 The IPC Gansow 464 battery operated sweeper is an ideal entry level machines for smaller floor areas. Featuring a dust control system to capture all the fine dust normally created during sweeping. The main brush is self levelling to account for uneven floors and will cope with all debris. With on board battery charger, maintenance free battery and easy to use control panel. 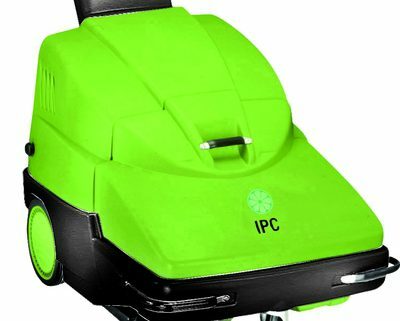 The IPC Gansow 712ET walk behind sweeper is the next model up from the 512ET. The main cylindrical brush picks up dust, stones, cans etc. while the vacuum system filters all the fine dust to leave a dust free environment while in use. The 712ET runs on a 24v maintenance free battery (petrol model also available) giving up to 2 hours use. With a 70cm main brush and 90cm with the side brush down you can quickly clean between racking or cover large open areas. The handle features the drive lever to propel the sweeper and a flap lift to allow larger debris onto the brush. The chassis is painted steel while the upper body is high density polyethylene making this the most robust machine available. With an on-board charger you don’t have to find a place for the charger, just plug and go. 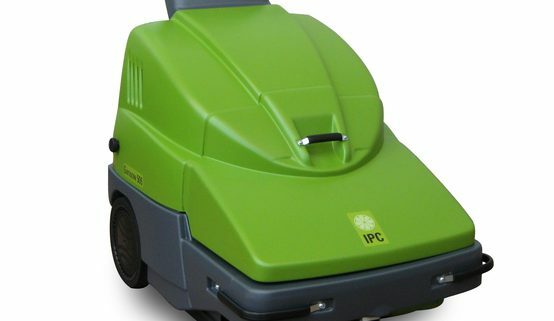 The IPC Gansow 705 pedestrian sweeper is the perfect answer for all internal and external sweeping tasks. The larger model of the 505 with an automatic side brush for edge cleaning kerbs, racking etc the 705 is incredibly efficient. The 705 main brush collects larger debris including leaf & litter, warehouse waste, car park debris and more. And while normal sweeping creates airborne dust, the 705 features a dust suppression system to filter all the fine dust in operation. The 705 leaves the working area clear of debris and fine dust to create a better working environment for the operator and those working in the area. With a 65L waste hopper and 90cm sweeping width the 705 can clean up to 4,500m²/h. Maintenance is very low on the 705 with adjustable brush height, high quality belts and maintenance free battery system. Available in either battery or petrol engine for maximum run time. The IPC Gansow 512ET walk behind sweeper is one of our best-selling machines thanks to its robust design and quick working speed. The main cylindrical brush picks up dust, stones, cans etc. while the vacuum system filters all the fine dust to leave a dust free environment while in use. The 512ET runs on a 12v maintenance free battery (petrol model also available) giving up to 2 hours use. With a 50cm main brush and 70cm with the side brush down you can quickly clean between racking or cover large open areas. The handle features the drive lever to propel the sweeper and a flap lift to allow larger debris onto the brush. The chassis is painted steel while the upper body is high density polyethylene making this the most robust machine available. The IPC Gansow 505 pedestrian sweeper is the perfect answer for all internal and external sweeping tasks. With an automatic side brush for edge cleaning kerbs, racking etc the 505 is incredibly efficient. The 505 main brush collects larger debris including leaf & litter, warehouse waste, car park debris and more. And while normal sweeping creates airborne dust, the 505 features a dust suppression system to filter all the fine dust in operation. The 505 leaves the working area clear of debris and fine dust to create a better working environment for the operator and those working in the area. With a 50L waste hopper and 70cm sweeping width the 505 can clean up to 3,500m²/h. Maintenance is very low on the 505 with adjustable brush height, high quality belts and maintenance free battery system.